Have a few servers and want to get some stats on IO, CPU, networking and other data don’t have full blown monitoring, this is where Munin can help out. Open your web browser and login. 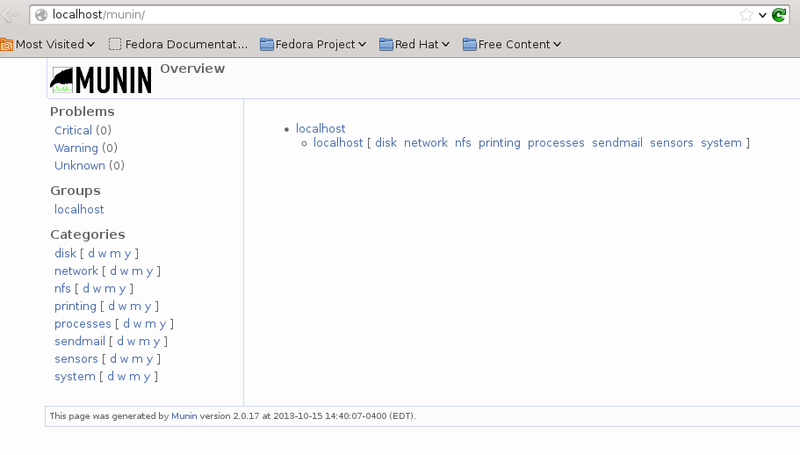 From this point you can click on localhost and see the statistics gathered by Munin. This is the default but as with other Monitoring programs there is always more. Now that we have the base we can add more monitoring. 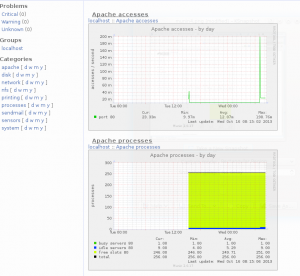 First make sure your Apache installation has server-status setup and running. Edit /etc/httpd/conf/httpd.conf and add to the bottom of the file. To monitor Apache create that the following sym-links in “/etc/munin/plugins“. Edit the node configuration file and add the code below to set up the Apache plug-in. 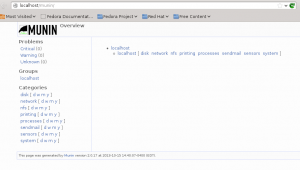 Save the changes to the file and restart the munin-node service on the server. 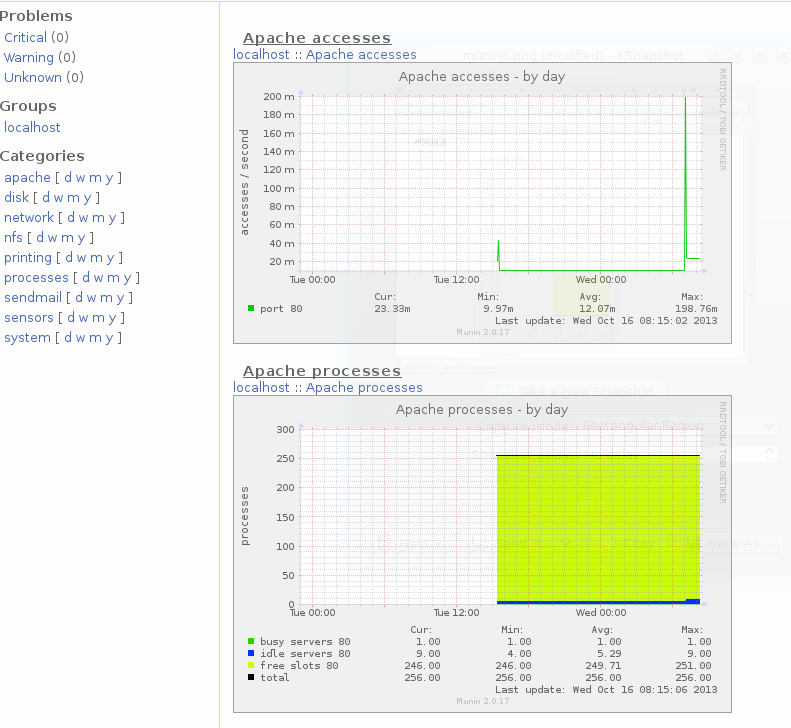 Refresh your browser and you will now see an Apache monitor displayed. Now that we have a master server and a node configured we can add additional systems. First we need to allow the Munin server to connect to the node you want to monitor. Edit /etc/munin/munin-node on the node to add. 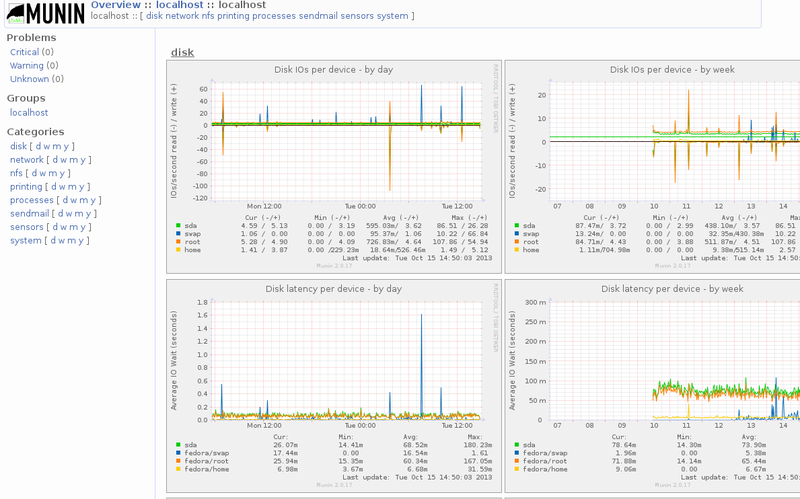 And add the Munin master server. This example we are allowing 192.168.1.100. Make sure port 4949 is open between the servers. 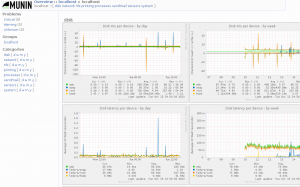 Edit /etc/munin/munin.conf on the master server and add the server for munin to monitor. Give the server a few minutes to receive the information and refresh your browser and you should now see the added node. i did the same process what you have done but the graph isn’t getting updated.i idle. please can i have a video so that i will be the luckiest person in the world to configure munin. please share me the video with clear steps and voice so that i will be the successful person to add apache and mysql……..